Writer-Director Richard Linklater’s latest film, Boyhood, is a magnificent feat of filmmaking. Filmed over twelve years with the same cast, the film charts the life of a boy growing up in Texas from the ages of six to eighteen. It’s an amazing experiment, but is it a good film? The film follows Mason (Ellar Coltrane) as he deals with life and growing up. His parents, Olivia and Mason Sr. (Patricia Arquette and Ethan Hawke), have already split once the film starts and we get to see the influence each of them has on his life. Mason and his older sister Samantha (Lorelei Linklater) live with their mother full-time and have to move around a few times as she marries and divorces and works on furthering her education. The way the film was shot, we get to see these characters age naturally before our very eyes, which is fascinating for a film. We follow Mason all the way up to his going off to college, but the majority of the three-hour film takes place in his teens. It’s a very good film, but not without its problems. 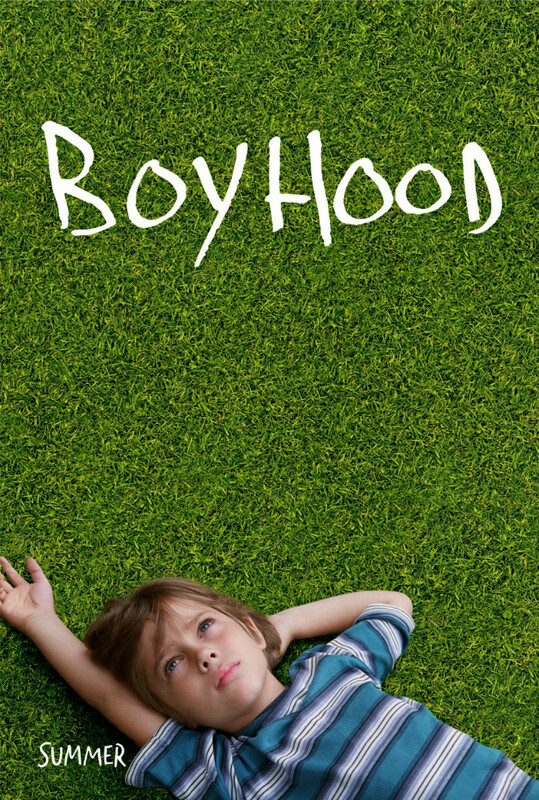 The title Boyhood is a little misleading. The story is mainly about the family as a whole and I found Mason’s parents to be the most compelling characters. It’s true that our families shape us as people, but the other half of that equation is friends. While it’s true that Mason, Olivia, and Samantha move around a couple of times, we never truly meet any of Mason’s friends. We get to know one girlfriend, Sheena (Zoe Graham), a bit, but we see very few meaningful scenes of his social life. He has a brief altercation with a bully in the boys’ bathroom at school, but that goes nowhere. He doesn’t get into fights nor do we see him having a ton of fun with his friends. As he gets older, he becomes more of a detached kid and a vessel for Linklater’s philosophical mumbo jumbo. Some of his philosophy works coming out of Mason’s mouth and is good, while other parts are eye-rollingly bad because the audience knows that a kid Mason’s age isn’t mature enough to have some of the opinions he has. Also, especially as he gets older, some of the conversations Mason has are very stilted. Some would say that is more natural, but I chalk it up to bad acting and writing. It became a little much for me, but as an overall experience, I enjoyed the film. Another issue with the film is one of plot—there is none. I understand that the point of the film is to tell an open-ended story with no real plot, but I felt the film would have been more entertaining if things actually happened. I’m not saying we need to see every life-changing event in Mason’s life so that it feels like checking off boxes on a list, but something interesting would have been nice. For instance, the kid is active throughout his life, riding bikes and such, and we never have a scene of him breaking his arm or anything? It’s a mundane thing to happen, but it happens to kids all the time. When Mason’s first step father (Marco Perella) turns out to be a raging drunk, it’s cliché, but I was thankful that at least something was happening—some drama. It seemed like Linklater was intentionally avoiding drama in many scenes—setting things up with no payoff. I was very disappointed in one scene in particular. Another cliché that Linklater enforces is that women who marry alcoholics continue to marry alcoholics, as Olivia marries two. However, Mason’s confrontation with his second step father, Jim (Brad Hawkins), is much different from his first. Jim is a war vet and corrections officer, who is very much a man’s man and scoffs at Mason’s more artistic nature. However, he is also the one who gives Mason his first camera that sparks a love of photography in the boy that carries him through the rest of his life. So, when the two of them have their big confrontational scene together, it fizzles. Jim makes some empty threats and Mason just blows him off. It may be more true to life, but I wanted to see more internal conflict from Mason. It’s pretty much the last time we see Jim and we never get any real payoff from the scene. How did Mason feel clashing with the guy who introduced him to his first love in life? We never find out. It became frustrating at points throughout the film. What results is a documentary-style film, which is fine, but even documentaries have narrative framing devices. The girl Mason meets at school in the film’s conclusion is named Nicole (Jessi Mechler). I thought it might be relevant because earlier in the film, during one of Mason’s more embarrassing episodes, a classmate named Nicole reaches out to him. I hoped Linklater would reveal the two Nicoles were the same person, but alas, he didn’t. It would have been a nice, sweet twist that isn’t as implausible as people might think. Stuff like that happens in life all the time—running into people you haven’t seen in years at odd, unexpected times. That’s life too, not just the mundane day-to-day stuff that Linklater documents here. The acting is fairly solid throughout. Coltrane is very naturalistic in his performance, especially as a child. As he grew into his teens, I got a real Hayden Christensen vibe from him. That’s neither good nor bad, it’s just who he reminded me of. He does a fine job here for the most part. Arquette is very good here as Olivia. You can feel her character just begging for a break, but at the same time, you have to shake your head at some of her poor life choices. Lorelei Linklater is all right as Mason’s sister, but she’s really just coasting through. The real treat here is Ethan Hawke. The movie hums with energy when he’s onscreen and I found myself wanting more of his character in the film, as I’m sure Mason did as well. Overall, Boyhood is a good film, but beyond that, it’s an amazing experiment. I fear that critics will get overly wrapped up in the scope of the film and how Linklater did it and ignore whether it is entertaining or not. It’s definitely a high achievement that really feels its three-hour length at times. Fantastic concept, but the execution could have been a little better, I think. This entry was posted in Movies, Reviews and tagged 2014, Boyhood, Ethan Hawke, Film Reviews, Films, Hodgepodge, Movie Reviews, Movies, Patricia Arquette, Podcast, Reviews, Richard Linklater. Bookmark the permalink.